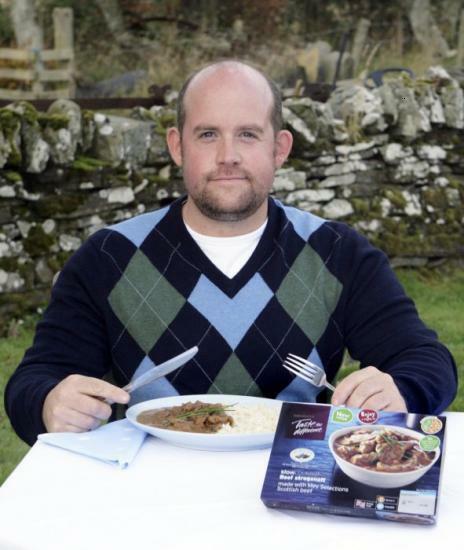 Mey Selections farmers are pioneering a new approach to own label ready meals with Sainsburys. North Highland Products, in partnership with Sainsbury's has launched a quality range of new ready meals as part of the retailer's Taste the difference range. Pictured above is Danny Miller, Chairman of North Highland Products, enjoying his Beef Stroganoff with Rice, one of the new ready meals. In between appreciative mouthfuls, Danny explained: "With our meat processor Dunbia, we have developed seven tasty recipes, all of which use Mey Selections Scottish Beef from the North Highlands." "The fact that they use Mey Selections Scottish beef is clearly mentioned on all the packs and we are very proud to have our logo and website displayed to the thousands of customers who will see the products in over 400 of the supermarket's stores throughout the country." Judith Batchelar, Sainsbury's brand director, explained the company's strategy of using "signature" ingredients to bring the quality of the product to the attention of shoppers looking for premium products. "We have products which are unique to us and which we're proud of," she added. The Chairman explained that, "As with all Mey Selections products, we will ensure, that the farmers who provided the beef for these products will receive a premium for their cattle, as we remain committed to supporting the people and businesses of the North Highlands. The launch of these products now means that our demand for cattle from the North Highlands will increase by 30% this winter." The new products in the Mey Selections range include: Beef in Ale and Dumpling, Taste the difference Chilli with Coriander Rice, Taste the difference Beef Stroganoff, Taste the difference Beef Stroganoff With Rice, Taste the difference Slow Cooked Beef Bourguignon, Taste the difference Beef Lasagne 900g and 400 and Taste the difference Slow Cooked Shin Of Beef.